See that, up there? That's what I had for breakfast. Wanna hear something else? I MADE it. Lastly, it was gah-ood!!! Blend the frozen berries until they are crumbly then add the sugar. Blend again until creamy. Place the cookies in a plastic zip bag and crush them. 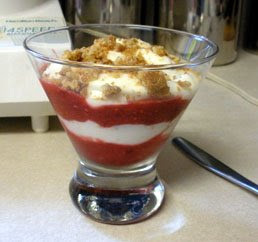 Using small glasses/cups/shot glasses/martini glasses - whatever, layer in this manner: raspberries, yogurt, cookie crumbles - repeat until glass is full. Devour!! LOML loved it!! It's definitely one of those recipes that we'll use again. Just as soon as I get a new blender. The two I have are cheap ones that I've been overusing for years. In fact, one went to college with me (loads of rum runner daquiris.) Those blenders are just wore slap out. LOML is tired of my complaining about them and LOVES the stuff I make in them, so he told me to just pick one out. He's even okay with me picking out the one that can blend a cell phone. We'll see. If that was random enough for you, here's some "Totally Random Tuesday"
Check out this cool bike light that shines a bike lane around you. Lately, I've really been into making and looking up soup recipes. Hopefully, by this winter I'll be all ready with some great ideas. For now, here's some tips for better soup. It's Prom season and I don't know if you've ever heard about the duct tape prom contest, but Mental Floss covers it here. I may not post tomorrow as I will be spending the day with the nieces at the Exploreum. In fact, I'm gonna spend the night with them and my mom tonight to ensure we get an early start on the day. I can't decide whether or not to take over a craft project for them. They were asking about some soaps I had made. I'm considering taking those supplies over as I hardly ever use them myself. Hmmmm.... hot soap, little girls - we'll see.